3.0 颗星，最多 5 颗星Not the best at all. After God Emperor I don't get this book being so damn boring in comparison. I'm really very disappointing to the point of being angry. I felt tugged between extreme boredom and some very very well written moments between characters. I grew very impatient with the back and fourth in every chapter and then getting into it only to have the story fizz out like a balloon with no pop. Pissed me the hell off honestly. I'm reading the sample of Chapter house to see if I can get over this and read the last of the Herbert books before his son took over. God Emperor Dune was such a perfect and genius piece of science fiction. It resonated with me for years. To go from that to this is utterly frustrating. Maybe if they had published both Chapter House and Heretics in one I might have had less to moan about. We shall see how Chapter house goes. This book was by far my favorite in the series. I was sad to have finished it, the characters were so real and honest and inspiring in their humanity or lack of it. Miles Teg was a man i wish i could have known. Mr Herbert's grasp of so many disciplines, politics, science, metaphysics, culture and psychology is without match in weaving together an epic story. This is unfortunately the weakest entry into the Dune series up to this point. I have no idea how good or bad Chapterhouse Dune is going to be since I have only read the first couple chapters just now, and based on what I heard about the entries that his son wrote (both the quality of writing and how the content there doesn't even mesh at all with the universe Frank Herbert created), I will not be reading those no matter how bad of a cliffhanger Chapterhouse Dune ends on. There is no shame in being the weakest entry in a series like Dune, though, given what it's up against. 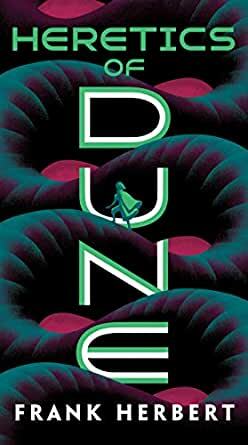 I absolutely loved the first three Dune books and I can't think of anything bad to say about them. You could argue that God Emperor of Dune is a bit bloated and maybe it focuses way more on the philosophical aspects of Dune than it does on it's plot, but I still enjoyed the book and I never found it tedious or boring at any point and I would recommend anyone read it. So what about Heretics of Dune? But then that brings us to the negatives, which would mainly be the beginning and ending of this book. I'll lay it out here without spoilers first. Basically, the first 130 pages is a choppy mess of exposition, info-dumps, and character background. The previous books always did a much better job with this, so I'm not really sure what the problem was here. And then the ending was just a choppy mess. Had the beginning been trimmed and edited a little, and had the ending been expanded upon, this would have been a much better book. I can't get into my problems in detail with the ending without spoilers, so if you haven't read at least the first five Dune books, skip this paragraph. You have been warned. So anyway, onward with spoilers. Basically, in the last few chapters, Teg gathers all of his old war buddies together and they agree to help him and he says he needs to steal a no-ship. And in the next chapter he has that no-ship and he is with Lucilla and Duncan and they're heading back to Arrakis. It would've been nice to have gotten a chapter of them stealing that no-ship, and then we get another chapter where he reunites with Lucilla and Duncan. I mean, okay, I get that the book was maybe getting a bit too long and everything and maybe it was felt that how he got the no-ship wasn't nearly as interesting as what came after, and...I guess that's fine if Frank Herbert felt that way. But that's not even the worst of it. The worst is that Arrakis gets destroyed and it felt so abrupt to me and we didn't even get to see it. He just goes to Arrakis, gets the worm, gathers Sheeana and Odrade, and they leave and the next chapter Arrakis is destroyed. It would've been like if in God Emperor of Dune, we didn't get to see Leto II die, but instead just had the last chapter of Siona telling everyone that through an assassination attempt, Leto II fell into a river and melted in there. Paul Attreides/The Preacher was the most important character in this whole series, and in book 3, he may not have gotten the best death scene ever written in any book, but at least we got to see it happen. But nope, Arrakis just blows up off screen and Teg stays behind while it blows up. He's not the best character in the Dune series, but he was still important in this book and I still liked him and would have wanted to see his death. Given that most of this series is told from an omniscient point of view, giving him a chapter where we see his epic sacrifice would have been easy. In the first Dune we even got a chapter of Liet Kynes dying in the desert and arguing with a hallucination of his father. So what's the problem here? So is Heretics of Dune worth reading or should you stop at God Emperor of Dune, since you get closure with God Emperor and you don't get it at all with the subsequent books? That's a tough call to make. A lot of this book does seem like buildup to the next installment, so whether it's worth reading (and whether I'd read it again if I ever revisit the Dune books) is going to depend heavily on how good the content of Chapterhouse Dune is despite the lack of any resolution. Lastly, this review is based on the Kindle version, as I own all 6 Dune books on my Kindle. I had no issues with the formatting of any of the Dune books the way other people seem to have. The excerpts at the beginning of the chapters were formatted best in Dune and God Emperor of Dune, but the excerpts are in a serviceable format in the other 4 books. My only complaint would be that Children of Dune forces a smaller font, at least it did for me, and I don't know why. And the first Dune book, you have no way of determining how long the chapter is before you read it (and the page numbering for it is probably messed up too). But aside from those issues, if you own a Kindle and you want to read these books on it, I'd say go for it.